Would you like to have some Nyonya Cuisine? Steamboat dinner? Penang hawker delights? If you are undecided what you want to have, perhaps, you can drop by to Ivy's Kitchen. 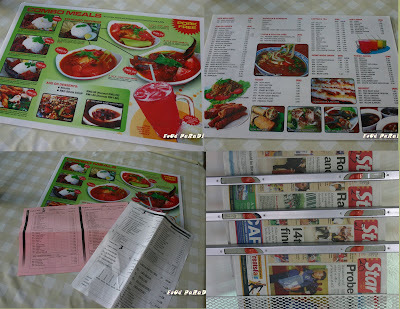 A wide range of menu and free newspaper for reading while waiting for your foods being served. Currently, Ivy's kitchen is installing air condition for the interior dinning. For the outside dining, there are fans too! 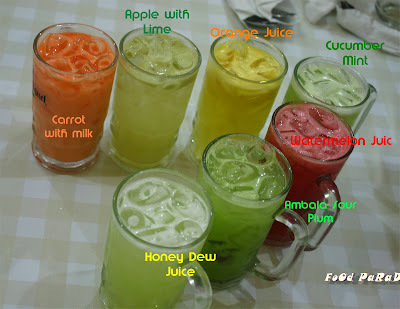 Wide ranges of fruit juices such as Honey Dew Juice, Ambala Sour Plum, Watermelon Juice, Cucumber Mint Juice, Orange Juice, Apple with Lime (New) and Carrot with Milk Juice. Tan new invention is Apple with Lime. Cynthia have this and she feels that it has too much lime in there for her personal liking. Chan took the cucumber mint and he reckon that there are more cucumber in there than mint. 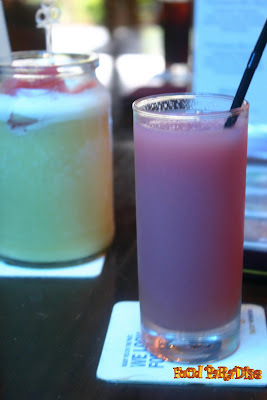 ^-^ All the drinks cost RM2.20 each. There are lots of ingredients in the soup such as seaweed, vegetables, tofu, fish balls, prawn, hand made chicken balls and........ The soup are very tasty although it is an simple soup. I guess my gal will loves it very much. Ah.... this is one of their signature dishes. Since it is sweet and sour flower crab, it does not taste spicy at all. But I think my gal will find it a hint of spicyness. But if you want to have more spicy crab, you can always tell them when you placed your order. Or the other way round when you have kids dinning with you, you can always asked them to reduce the spicyness. I think most of us love the sauces very much to go with the rice. The crab is very fresh and nice. We were thinking that if there are mantou to go with that will be GREAT. But according to Tan, it needs lots of preparing for the mantou. So they did not served it with mantou at the time being. One thing that I should mention here is that Ivy's Kitchen is a Pork Free Traditional Nyonya Cuisine. So, there are no pork being served here. All the ingredients use are mainly chicken. So as the Joo Hu Char, although it did not used pork, it still tastes good and juicy. 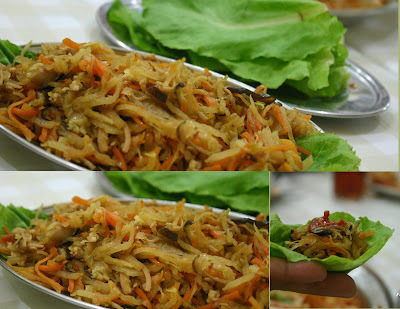 I love Joo Hu Char but I never prepared it by myself. Most of the time, I saw my MIL and hubby aunt prepared this dish as it needs plenty of time to cut all the ingredients into small tiny slices. You can always have Joo Hu Char with the rice or even with the vegetables provided. 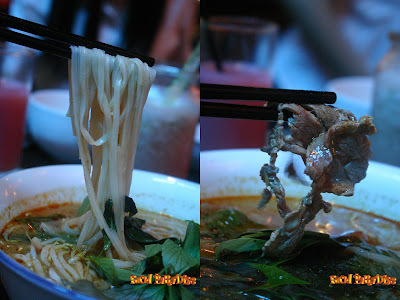 Ah.... another one of my favorite food - lor bak. Please reminded again this is chicken lor bak. I like the lor bak that wrap very tightly and firm. And this shop serves the lor bak that I like. It is very crispy in the outer part. Next, we had some gulai tumis ikan. I think everyone enjoy it very much. The fish is very fresh. There are lots of herbs used in this gulai tumis ikan. For me, the curry is not very spicy. I guessed my gal might like to try this when she wants some curry fish next time. This is one of the recipes that passed down by Tan's mother. Give it a try! This is a complimentary dish for us to try. Since, I did not take beef, I did not try it. But Cheryl and Alan, love it very much. 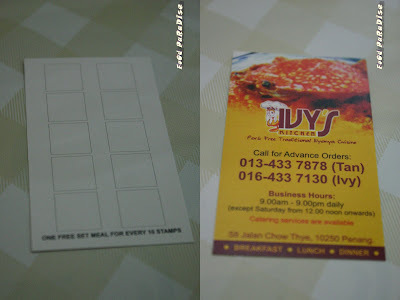 Ivy's Kitchen is also running some promotion where each RM5 you spent, you are entitled for one stamp. Once you accumulate 10 stamps in one card, you entitle for a free set meal, or RM7.50 discount on total bill. But for bill discount on total bill, maximum 2 cards are allowed per visit. And many thanks to Mr. Tan, Ivy and Criz for this invited review. 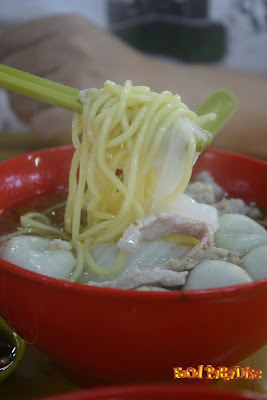 During one outing with hubby, hubby wants to try the Koay Chap at Air Itam Market. So we get up early and head to Air Itam. No matter it is weekday or weekend, there are lot of people in Air Itam market. Parking is also a problem. We have to park far away and walk to the destination every time. ^-^ Good exercise for us. We were so disappointed that the Koay Chap stall is not open on that particular day. So we decide to try the koay tiaw thn'g since some one told me that the KTT is nice. Hubby had this. And he reckons that the KTT is just so-so for his liking but agree with me that the minced pork tastes nice. Have you try this KTT before? and how about the koay chap? Anybody know the operating hours? During one outing, hubby is asking us what shall we have for dinner. And all of sudden, we kept quiet as cannot think of what we want. Then hubby suggest that we go for Thai foods. As we noticed a Thai restaurant along Light Street few months ago. Since there are no objection from my gal, we head down to town. Interior of Thai Garden Restaurant & Pub. When we about to enter this shop, I notice that it is also a pub. Then I asked my hubby whether our little gal can go in or not. ^-^ Then hubby told me, one way to find out is to go in and see. lol So...... we were greeted by the waiter there and they lead us to the sitting area. You have to passed through their pub area then will lead you to the sitting area as above photo. Since we saw this on the today special menu while on our way into this shop, we decide to order it since my gal loves pineapple very much. This is not as spicy as the Tom Yang Gong but my gal still find it a bit spicy for her. But she loves it very much. My gal wants to order some green curry to try. But it turns out to be very spicy for her. She told me that she loves the flavours very much. There are lots of herbs in this green curry. And the aroma is very nice. Furthermore, the chicken is very tender. If you like to try some Thai Food, you can drop by and give it a try. The service is very attentive. I noticed that there are quite numbers of people patronise this shop when I dine in there. And some seems like their regular customers. How many times do you asked your friends, families, colleagues........ where should we have our meal? Usually, most of the time, I will have the answers such as no idea, up to you, don't know, "chin chai"........... all sorts of this. 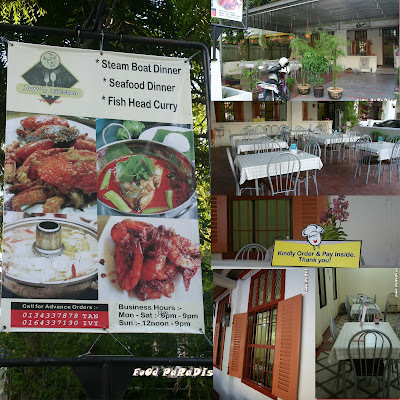 Location: 98-1-26 Prima Tanjung, Tanjung Tokong, 11200 Penang. This drink has a very strong guava aroma. 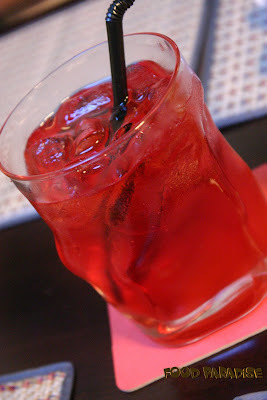 And if you like guava, you will love this drink. Glamorous smoothie of pink guava & pineapple with sour plum. A rich and delicious banana smoothie with ice cream & chunky peanuts. There are lots of peanuts in this drink. Delicious & wacky smoothie of mango yogurt & pineapple. When every one arrived except the organiser ~ Steven, we proceed to order some foods. Actually Cariso and I are not too sure that this is the invited review. As we thought that we are gather to discuss something. But after we confirmed with everyone, we were thrilled. As this is the first review that we can choose whatever we want to try. As usually, we just review whatever foods and drinks that are prepared by the proprietor. 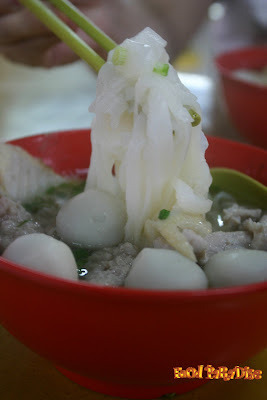 Our famous signature dish of rice noodle in a spicy & piquant soup with tender beef or chicken, bean sprouts and basil. When ordering this dish, Lingzie is asking if everyone taking beef. And Bee and I said we don't but we would like them to order it to try. But when this dish is being served, we have two kind of flavours, one bowl of beef and one bowl of chicken. Ken came and told us that since we don't take beef, he asked the kitchen to prepare the chicken version for us. He is very kind and attentive. Everyone get to taste the chicken too. And they reckon that the beef version is better than the chicken version. The Chicken Laotian laksa tastes very nice. This is my first time having it. I think every one loves and enjoy having this bowl of Laksa. We took quite a long time to shoot. Ken kept reminding us to dig in as he worried the textures of the noodles. But the textures of the noodles still maintain alright. So phew...... for Ken. Italian styled chicken fillet with stewed tomato and Mozzarella cheese. Served with mash potato and salad. The chicken is very tender but a bit dried up. Perhaps due to our shooting time. As Bee told us that when she had this previously, it is very juicy. The mashed potatoes tastes very nice too. Char-grilled tender beef steak with traditional rich brown gravy and served with homemade mashed potato, broccoli & carrots. This is also order from Leslie. Pan-grilled white fish fillet with a tangy white sauce and served with fresh crisp salad & mashed potato. Usually, when we had something with white sauce, we will end up full very fast. But for the white sauce served in No Eye Deer is totally different as they add some lime into it. So you will not have that "Jilat" feelings. The fish tastes very nice and juicy. We were told that their fish and chips are one of the best selling items. So, when you drop by, please try it out. Mixed platter of char-grilled lamb, chicken kebabs, chicken sausages, chicken wings & pepper lamb sausages. This is the last dish to arrived and it is the mixed platter. It is a bit dry for some parts of the char-grilles lamb and chicken wings. But still taste ok. The chicken kebabs, chicken sausage and pepper lamb sausages are nice. 'Fantastically refreshing" Japanese Jelly dessert served with silky fresh cream and syrup (voted Best Jelly in Malaysia by readers of 'The Star' Newspaper 23rd March 2008). I am telling all of them, I wanna have desserts. Must have desserts and all of them laugh at me. I insist that we must have the Coffee Jelly since it is voted as best jelly in Malaysia. ^-^ At the first bite, the coffee jelly is very bitter but when it immerse with the fresh cream and syrup. It tasted nice. Have a try! Double scoop of vanilla ice cream drizzled with melted chocolate and roasted nuts served with a wafer cone in an ingenuous way. We did not have this. This is Chris desserts. ^-^ I think my gal would love this ice-cream. I will bring her there for fish and chips, spaghetti and also ice-cream. I would like to thanks Steven for organising this review for us and also many thanks to Mr. Ken Low.